When Piper Cochrane’s five-year-old daughter said she wanted to open a candy store, she didn’t try to brush off her little girl’s talk as a childhood fantasy that would never become a reality. When Piper Cochrane’s five-year-old daughter said she wanted to open a candy store, she didn’t try to brush off her little girl’s talk as a childhood fantasy that would never become a reality. Instead, Cochrane did something that put her in the running for Mom of the Year—she told her, “Of course you can open a candy store—and I’ll even help.” Read on to find out how this mom and her budding entrepreneur got their brand, Organic Candy Factory, RangeMe Verified™ and onto the shelves of Hy-Vee. Not many five-year-olds would have the chops to start a business at such a young age. But when you have a supportive mom to help, anything is possible. Cochrane didn’t want to crush her daughter Ginger’s spirit by shooting down the idea of a traditional brick-and-mortar candy store (something out of their initial budget), so instead, she suggested that they start an online store. Cochrane wanted the candies to be organic, gluten-free, and made without chemicals that would pollute the earth. 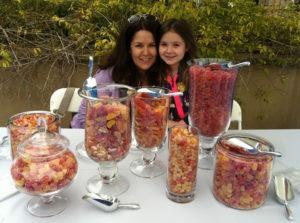 Eventually, she found an Illinois-based company that would sell them gummy bears that met their standards in bulk, which Cochrane and her daughter repackaged, photographed, and added to their online store. The teddy bear on their packaging is something Cochrane’s daughter drew herself. Unexpectedly, the Cochrane ladies’ idea started to take off, and orders for their organic candy started coming in. Cochrane attributes a lot of their early success to the luck of choosing Organic Candy Factory as their name. “I think when people typed ‘organic candy’ online, we just automatically came up even though we were not a full-fledged business. I think we got really lucky,” Cochrane says. 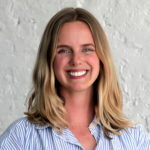 While Cochrane and her daughter have the product development side down, joining RangeMe helped alleviate a lot of the daily business aspects that can be taxing on a small company. 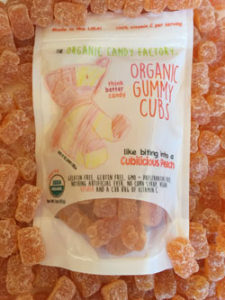 Connecting with Hy-Vee via RangeMe rocketed Organic Candy Factory into new territory, as the grocery chain ultimately chose two gummy bear flavors—peach and berry—to stock in a number of their stores. Working with the chain was relatively simple, Cochrane notes, which made the deal all that much sweeter. With so much success under their sugar-coated belts, Organic Candy Factory is poised to keep growing. They’re developing four new products, and Cochrane says a lot of what they do is based on feedback she receives from customers, as well as her daughter’s intuition for the company. They hope to find a business partner that can help them scale to the next level of sales and production. But ultimately, it still boils down to a mom helping her daughter fulfill a dream.